No doubt about it. Hands down! Germs are absolutely the very worst part of living with kids!! I've been sick more this past year than in the last five years. It's crazy! I think they are little incubators breeding, fostering and sharing the strongest and most intense germs known to man. They put everything in their mouths, touch every surface and no matter how much you disinfect, wash your hands, etc. there is no escaping it. Colds, the flu and viruses are just part of life with little ones. Somehow it seems all that's needed to invite those buggers into our home is making plans. Funny how that works, isn't it? I had big plans for Restaurant Week, I had dinners coordinated with friends, reservations were made, and then it struck... Poor Lexi was the first to show signs, followed by Addy, and then, Frank. By the time, Frank was full blown sick, Lex was so dehydrated she had to be hospitalized. That's when we learned it was Rotovirus. Addy also needed fluids, but she was never admitted. It was bad, bad, bad. Frank was miserable, but heavy doses of Pedialyte kept him from needing medical care. Just when we thought we were on the path to wellness, not even I could escape the inevitable. All the hand washing, scrubbing, bleaching and disinfecting wasn't enough. Nick, Amy and Jeff must have immunity of steel because they were unaffected. The rest of us, though... Man, it was the pits. Without kids of my own, I've never had to care for kids under the weather. With Amy and Jeff both working, I look after the kids 3-4 nights a week. 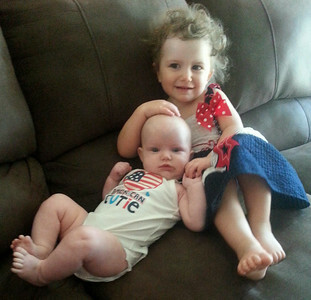 The two weeks while the virus ran through the house was incredibly challenging. Sick kids are just pitiful. It's the saddest thing to see their spirit drained. You want nothing more than to scoop them up and make them well. Hospitalized babies just split your heart in two. I'm thankful that Lex was able to get the help she needed and only needed to stay for two nights. I know many families aren't so lucky and time in the hospital can be more common than time at home. I cannot imagine what they go through, but thank goodness for pediatric doctors and nurses that work so hard to make them well. As part of "Reading Week" at a local elementary school. I volunteered to read to a second grade class yesterday. They were very cute and inquisitive. After reading The Stinky Cheese Man and other Fairly Stupid Tales the floor was opened to questions. Most were personal in nature. They were curious about my age, my job, where I worked and how long. They were most impressed that I was not afraid of heights, followed by the length of time at my job - 13 years. "WHOA!" The kids all shouted in unison. Perspective can be a funny thing. I've been at my job for more than a lifetime in their eyes. As for me, it's gone by in a blink of an eye. The past thirteen years have been a wild ride. In 2003, THEhotel at Mandalay Bay just opened. Now, it's been rebranded as The Delano. One of the first projects I worked on was Le Reve, which was later renamed the Wynn. I was thrilled that I'd have a hand - however, small - in shaping the future of the strip. Over the years, I watched as the Palazzo, Encore, CityCenter, and Cosmo went from drawings on paper to casting shadows on Las Vegas Blvd. I've seen the Aladdin become Planet Hollywood, Barbary Coast change to Bill's Gambin' Hall and eventually into Cromwell, and the Imperial Palace morph into the Linq. I've seen the dreams of Fontainebleau and Echelon shatter. I've said good-bye to the Frontier, Stardust, Sahara, Riveria, Boardwalk, and Westward Ho. I've most recently worked on Lucky Dragon and the T Mobile Arena. I eagerly await Resorts World and Alon. Meanwhile, I married. Twenty-something quickly became thirty-something. Bought (and lost on) real estate. I led the way for my mom, brother and sister to also move to Las Vegas. And now, possibly my dad. Frank and I have suffered great sorrow and profound joy. We know sickness and cherish health. Poorer. Richer. We've learned volumes and still know nothing at all. We've traveled to Europe, Central and South America and still have the world to discover. We have dreamed big and continue to dream bigger. 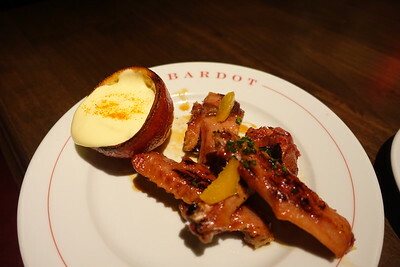 $50 dinner at Bardot Brasserie. See what I did there? Cheesy right? It feels a bit like Christmas though with all these great restaurants participating this year. Bardot is one of those restaurants I've been meaning to try since it opened, but for one reason or another it just hasn't panned out. Restaurant Week was the perfect excuse to make it happen. A friend joined us, it was his first visit too. I've been a big fan of Michael Mina for ages it seems (RIP Seablue) and I knew we'd be in for a treat. I was content to order from the $50 selections, but there was an $80 menu offered, as well. Crusty baguettes and warm salted butter got us started. Wood grilled duck wings with blood orange glaze followed. They sure where sticky, not too meaty, but tangy and tasty. For the main course, the pork chop and the seabass were had. 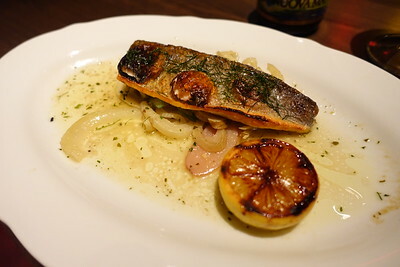 The fish was flaky, light and wonderfully seasoned, served with a simple side of fennel. The chop was bursting with smoke flavor, tender and fit for hearty appetites. 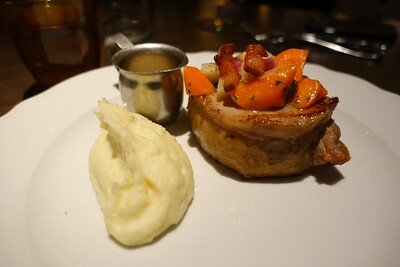 The horseradish mashed potatoes were a favorite, they definitely left us wanting more. Alas, we must save room for dessert. 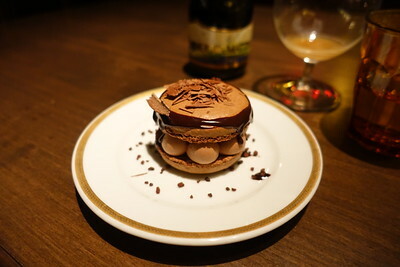 The chocolate macaron was sinfully decadent without being overly sweet. Service was attentive despite it being a packed house. Seriously, every table was full and there were several large groups. I can't recall when I last saw a restaurant so busy mid-week. It was a nice sight. Without question I'd return to Bardot Brasserie. There's so much more of the menu I'd like to explore. It's my favorite time of the year! Restaurant Week is upon us. June 6-17 you can help out the Three Square Food Bank by dining out at participating restaurants. This is the 10th anniversary and there is a wide variety of restaurants to choose from; prices vary from $20-$80. It's the perfect time to try a new restaurant or return to an old favorite. Last night, we gathered with family at Bottiglia to celebrate a birthday. It's the newest restaurant at Green Valley Ranch, it may be tucked inside a local's casino but it has all the flair of a strip experience. The restaurant is stunning, it is light, airy and oozes charm. It has a lovely patio too. We were asked if patio dining was okay, but even with misters, 105+ was a bit too warm to be comfortable. We preferred a table inside; we were quickly accommodated. Service was sluggish and maybe that's due to the restaurant being so new? But it started slow and failed to improve throughout the course of the meal. Fortunately, the food was very good. Everyone is our party opted for the Restaurant Week Menu. $40 was rewarded with your choice of arancini or chopped salad, followed by choice of halibut, chicken parm or pappardelle bolognese, and tiramisu for dessert. We also ordered a pitcher of the Red Sangria ($40) which was rather heavy on ice. Both appetizers went over well. 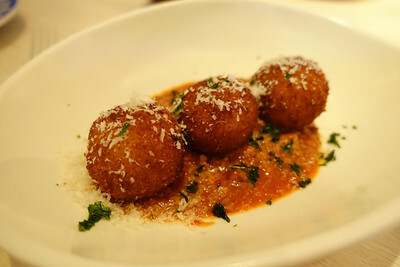 I chose the arancini and it was scrumptious. Delightfully cheesy, perfect crunch and the risotto was just right. Bravo. The entrees were also a success. 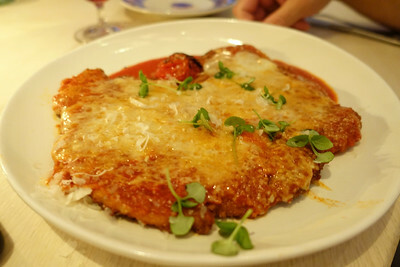 The chicken parm was massive. 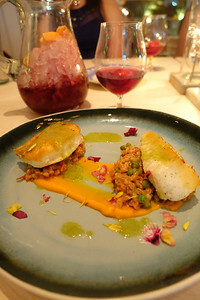 The halibut was a nice sized portion as well. By this point, we wondered about a bread basket. Since there is no pasta served with the parm, it would've been a nice accompaniment. It was never offered, but we did have bread plates since the start of the meal. An oversight, perhaps? 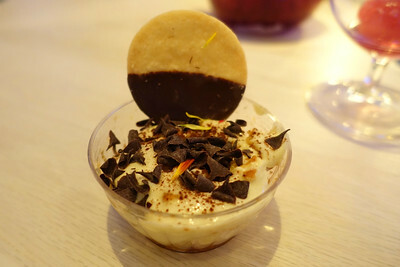 Dessert was the weakest link and it felt a bit chintzy served in a disposable goblet. It felt very disjointed since everything else had such pretty presentation. Bottiglia is a great addition to GVR and in time, I believe they will achieve a better level of service. It struck me as being most ideal for a night out with the girls. Additionally, they offer a happy hour (M-F 5-7pm) that looks enticing. Once the weather turns a bit cooler, I have no doubt the patio will be a hotspot! After a two year hiatus, we finally got back out on the trails. It was LONG overdue. It was sad that the only dirt the RZR was seeing was the dust that collected on it while it sat in the garage. Injuries kept me away from it. As I recovered, we still weren't able to ride because we had no way to tow it. Last year, Frank traded in the truck for a new Camaro. It's not that he didn't love that car, he definitely did. It just wasn't the most practical. So, he had fun for a year. He and Victoria had a good run, but now I'm the only woman in his life. Besides, we needed a truck, Ikea just opened. How else will I get my goodies home?! I had a rare Monday off - thanks, to the Memorial Day holiday. So, Frank and I went out to play in the desert. We thought we'd do a light run to get us back in the swing of things. I was curious how I'd tolerate the ride with my neck and ankle. 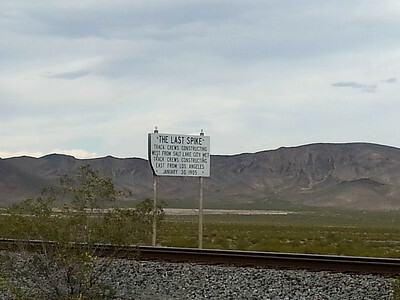 We planned to ride out to Goodsprings, beginning near Las Vegas Blvd just south of Sloan. We headed north, and found ourselves on half-a-dozen trails to nowhere. We finally crossed the train tracks at Sloan and soon found ourselves on a familiar trail. 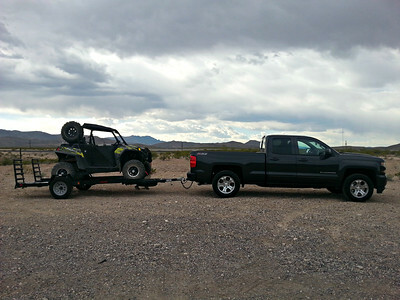 Years ago, we rode Tie Rod Canyon in the Jimmy. It's more rock crawling than trail riding. That stretch was rough, but we held our own. I was relieved when we came to the Rainbow Powerline Trails, because those are smooth sailing. 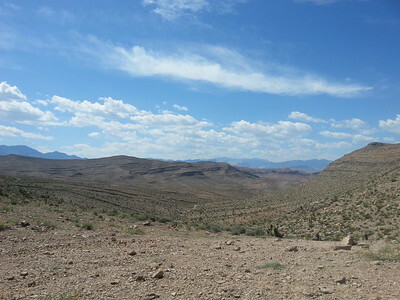 We went WAY out of our way, but we eventually connected with the trails that leads to Goodsprings. 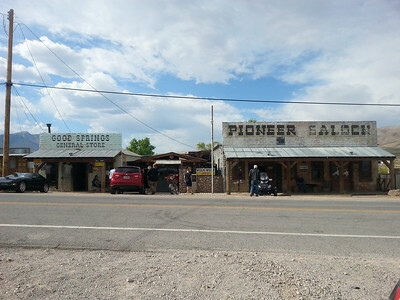 We had plans to check out the Pioneer Saloon since I've never been. By the time we arrived, we were parched and hungry. 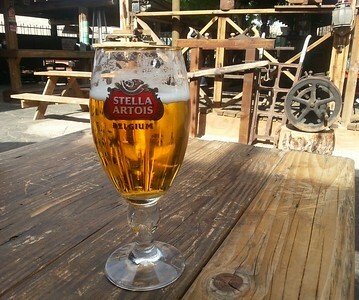 Stella hit the spot! Frank had the hangover burger and I opted for the BLT. Much to my surprise it was served on a hamburger bun. It was better than I expected - the bacon was really good. After the stop at the saloon we made our way back to the truck. 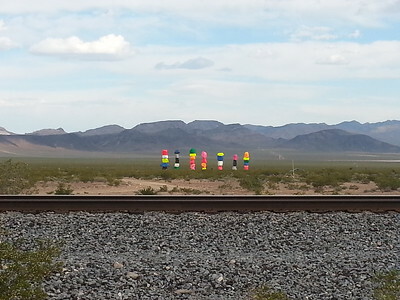 We got a good look at the new art installation and snapped a photo of the last spike on the railroad track which happened to be nearby. It was where crews from Salt Lake City and Los Angeles met in 1905. Now, if we could only get a high speed train between Vegas and LA. Wouldn't that be nice? Honestly, I'd be happy if they widened I-15 to allow for extra traffic lanes. Wishful thinking... In any case, we had a great time. It was nice to enjoy serenity of the desert. I definitely missed it. Summer was a little late to the party, this year, but I didn't mind it one bit. The month of May was pretty darn close to perfect. We didn't see triple digits until the calendar turned to June. Now, the heat is in full swing. Today is day two of 105+ thank goodness for A/C and the pool to keep cool. 93 is cool, right? That was the water temp yesterday. Those solar panels are working wonders. I've already swam more this year than all year's before combined. Heck, the kids were in the pool on St. Patrick's day. Money well spent. Fortunately, the weather was ideal last weekend we had a barbecue with friends to kick off summer. Have you see those Bunch O Balloons advertised, the ones that fill 100 water balloons in 60 seconds?! When Frank caught wind of them, he ordered them immediately. We invited a bunch of kids over to try them out. I had my doubts, but it was a success. They filled quickly and soon after, it looked like confetti rained down from the heavens leaving kiddos beaming from ear to ear. It was awesome. It totally beats the alternative of inevitably soaking everything in sight while filling and having to tie the balloons individually. These cuties were also a hit at the party. There cuteness is undeniable. Addison is at the best age, she smiles and giggles all day. She learns about 4-5 words a day and imitates every movement. Every little or big thing is a discovery with the utmost enthusiasm. It's a joy to see the world through her eyes. Alexis gave us hell for a month, I never really understood what is was to have a colicky baby. Now I do. Thankfully, she's settling down; smiles and coos are beginning to replace her cries. She amazes me with her strength and her beautiful big blue eyes. At 4 months old, she is supporting her head, turning over, standing and pulling herself up. She also likes to arch her back when she's angry, making it nearly impossible to keep hold of her. I'm least impressed with that trick. None the less, I'm lucky to experience them growing every day. I missed that with Nick.